BRIGHTON, Mich.- So you may have caught a glimpse of this fierce 2013 Mustang as photos from SEMA made their way to the web. But did you know that SEMA Mustang was Powered by Women, solely! Women from across the automotive industry joined together to create their very own 2013 Mustang GT. 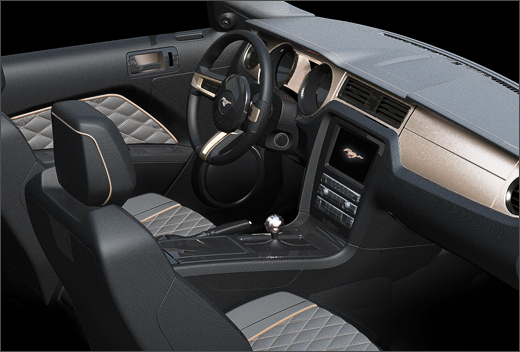 Ford Designer, Jennifer Seely's High Gear design was chosen with its leather wrapped interior, quilted leather seats and rose-gold chrome accents. To complete the SEMA Mustang Build Powered by Women, 30 aftermarket manufacturers from the SEMA Businesswomen's Network contributed to every aspect of the build. The automotive world isn't just for the guys, and these ladies proved it! We're impressed! To save money on your very own Ford Mustang, check out our Ford Mustang Rebates and Ford Mustang A Plan Pricing. Brighton Ford also sells Used Ford Cars in Brighton, MI if you're interested in an older model Mustang. We are a family owned and operated business that strives on customer satisfaction, located at 8240 Grand River Ave. just north of I-96 in Brighton. For more information on Brighton Ford visit www.BrightonFord.com or give us a call at (800)-836-8206. Ford Mustang? I really like it. I will buy one sooner and Im so excited.